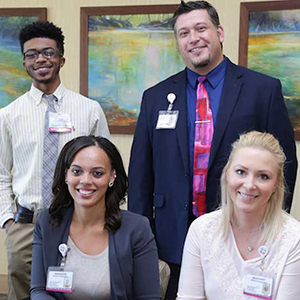 The Hartford HealthCare Cancer Institute at The Hospital of Central Connecticut is transforming the delivery of cancer care to patients across central Connecticut and beyond. This spacious and welcoming facility that opened in spring 2015 is bringing leading-edge cancer care in a warm, compassionate setting. The goal behind everything we do is to make the journey of care as easy as possible. We offer a wide variety of comforts and amenities designed to reduce the anxiety and fear that often comes with a cancer diagnosis. All patients who walk through our doors are greeted by a team of patient ambassadors who answer any questions and help guide patients to the areas where they need to go for care. The Cancer Institute also features the latest advances in treatment and technology in a warm and welcoming environment. The new center is part of the Hartford HealthCare Cancer Institute, which is the charter member of the Memorial Sloan Kettering Cancer Alliance. MSK is the premier cancer center in the country, and treatment standards within the Hartford HealthCare Institute are aligned with MSK. Patients also have access to MSK’s world renowned clinical research trials and protocols. Over 100,000 square feet of clinical and medical office space focused on the cancer care needs of the Greater New Britain community, making it easily the largest facility dedicated to cancer care in the region. Comprehensive breast health center that will feature full-service care for breast cancer patients, from diagnosis to treatment to survivorship. State-of-the-art radiation therapy featuring the most advanced technology, including intensity modulated radiation therapy and Novalis radiosurgery.. The latest in imaging technology, including MRI and PET-CT scanning. Ample and convenient parking, including a drop-off space at the entrance to the cancer center. Music in the main entryway from a player piano as well as professional musicians. A warm, welcoming entry area that features a stone-inlaid fireplace and staircase. Numerous fireplaces situated in patient areas throughout the building. A serene reflection garden, with a walking path and a small pond, in the back of the building. An infusion center featuring private bays where patients can watch high-definition TV or look out the window to a sweeping view of the woods and walking path in the rear of the building. Patient ambassadors (clockwise from back left) Donavan Rocha, Dave Donle, Malgorzata (Margaret) Kozdeba and Raysheda Humphrey. NOTE... some GPS systems may not find "183 North Mountain Rd". In those cases, use the address for the Dept. of Motor Vehicles (85 North Mountain Road) instead. From the hospital parking garage at 100 Grand St., turn left onto Grand Street and then turn left onto Linwood Street. Take a right onto Hart Street at the next stop sign, and proceed about a half mile to Corbin Avenue/Route 372, and turn right. Proceed approximately 1 mile and turn left on West Main Street. Take a right onto Journey Road, just across the Plainville town line. Continue on Journey Road and enter the facility parking lot. Avenue Exit 7. Take a left onto Corbin Avenue and go left again onto West Main St (there is a Shell gas station on the left corner.) Proceed on West Main Street approximately one mile and take a right onto Journey Road, just across the Plainville town line. Continue on Journey Road and enter the facility parking lot. Take Interstate 84 West to CT-72 East via Exit 35 (left lane exit) toward CT-9. Take the CT-372 Corbin Avenue Exit 7. Take a left onto Corbin Avenue and go left again onto West Main St (there is a Shell gas station on the left corner.) Proceed on West Main Street approximately one mile and take a right onto Journey Road, just across the Plainville town line. Continue on Journey Road and enter the facility parking lot.